I walked this, the 12th stage of the Capital Ring on the 29th November 2006, immediately after the 11th stage although I did not quite reach the official end of the stage when I stopped walking for the day. I walked the remainder of the stage on 27th December 2006. Starting in Highgate, from Shepherds Hill the Capital Ring heads down to briefly join the A1 Archway Road, photo 1, before turning left again into Holmesdale Road. A short way down Holmesdale Road there is access to the Parkland Walk which the Capital Ring follows to Finsbury Park. The Parkland Walk, photo 2, is a local nature reserve that follows the course of the railway that used to run from Finsbury Park to Alexandra Palace. The line was closed in 1971 and it now forms a 4.5 mile long linear green walkway. Photo 3 was taken from the platforms of the old Crouch End railway station. The path along the old rail line makes for easy walking along the tree lined route and is a remarkable green space so near to the centre of London. Occasionally there was the odd view to be seen such as in photo 4 which was taken from the old rail bridge overlooking the junction of Stapleton Hall Road and Lancaster Road which in turn pass over the rail lines that run between Barking and Gospel Oak. Eventually the end of the line is reached and the path takes a footbridge over more railway lines and enters into Finsbury Park, photo 5. In Finsbury Park I found that the route of the Capital Ring has been re-routed from its original course, now taking a longer, but far more scenic route along the banks of the New River round towards Clissold Park. From Finsbury Park the route used to head down to Manor House Station to cross the Seven Sisters Road before heading down Woodberry Down to turn right into Woodberry Grove. This runs into Lordship Road where a right turn leads into Allerton Road then turning left into Queen Elizabeths Walk which was followed into Clissold Park. This is an area I know particularly well as I lived in a flat on Queen Elizabeths Walk, close to the entrance to Clissold Park, for five years between 1987 and 1991; though this was a long while before the Capital Ring was thought of. The new route takes the Capital Ring across Finsbury Park to Green Lanes which is crossed at its junction with the New River Path, which unsurprisingly runs alongside the New River. The New River Path, photo 6, is then followed for a mile or so as it makes a circuitous route back round to Green Lanes. The path besides the New River was very boggy and waterlogged in places and it did not take too long until my shoes were completely covered in mud, they looked like I had been walking across ploughed fields out in the countryside rather than in the centre of London. I hope to walk the New River Path down from Hertford before too long and I made a mental note to make sure I wear my leather walking boots when I do. The path continues along the banks of the New River leaving briefly to cross the Seven Sisters Road at its junction with the A107 Amhurst Park before continuing on round to reach the East and West Reservoirs. On the way there was a good view across the Lea valley towards Epping Forest, photo 7.The reservoirs were built in 1833 to purify the New River water and to act as a water reserve and is now where the main flow of the New River ends. After passing by the East Reservoir, photo 8, the route crosses Woodberry Grove and continues along round the West Reservoir to what is now known as the Castle Climbing Centre, photo 9. This building, modelled on a Scottish Castle, was once the main water board pumping station. By the time I reached the climbing centre it was starting to get quite gloomy and the battery on my camera was also going flat and thus I decided to stop walking for the day and to head back up Green Lanes to Manor House tube station. This meant that I had a far easier journey home to Walthamstow than if I had continued on which would have meant ages on a bus. Up to this point almost all of this stage of the Capital Ring had managed to avoid any roads which is quite an achievement. The GPS made the distance between Highgate and Manor House tube station 3.6 miles which made a total of 13.2 for the day. A fingerpost outside the Climbing Centre showed it to be only 13.5 miles to the Woolwich Foot Tunnel so hopefully one more trip out will finish this walk. The Fingerpost also showed it was 25 miles to Hertford along the New River Path in one direction and 3.25 miles to New River Head in the other. Arriving back at Manor House Underground Station it was a short walk down Green Lanes to the Castle Climbing Centre to resume my walk along stage 11 of the Capital Ring. The path continues on down Green Lanes, crossing over Lordship Park before entering into Clissold Park, photo 10. The path winds its way through the park as it makes its way up to Stoke Newington Church Street besides St Mary's Old Church. Turning left along Stoke Newington Church Street, photo 11, the path continues on to Abney Park Cemetery. As I walked along it was interesting to see how the shops along the road had changed since I used to live there, the area seems a touch more up market now. Entering the cemetery with its tangled mass of headstones, photo 12, the Capital Ring heads along a path that leads to the old church in the centre of the cemetery before turning right to follow another path that leads to Stoke Newington High Road and the end of this stage of the Capital Ring. 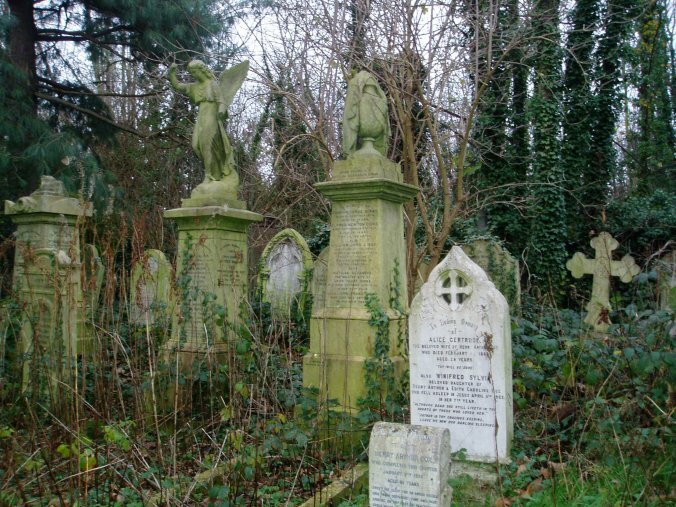 Believe it or not I had never visited the cemetery in the five years I had lived in Stoke Newington, sometimes you just don't appreciate what is on your own doorstep! I had walked a further 1.12 miles from the climbing centre giving a total distance for this stage of the Capital Ring of 4.36 miles, (Excluding the link to Manor House).